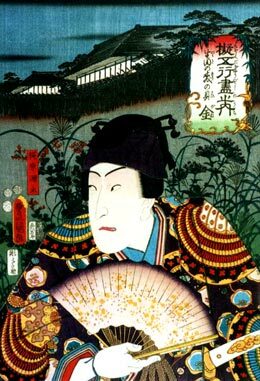 The actor Bandô Hikosaburô V held the name of Bandô Takesaburô I from the 1st lunar month of 1846 to the 2nd lunar month of 1856. Born in Tôkyô in 1898 in the district of Honjo. Son of Bandô Hikojûrô II and eldest brother of Onoe Kikujirô IV and Nakamura Tomijûrô IV. His first stage name was Bandô Ikkaku I and he made his first appearance on stage in 1904 at the Ichimuraza. He took the name of Bandô Takesaburô III in 1915 but held it only for a few years as he died the 18th of February 1919. 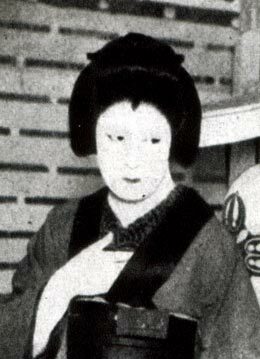 The actor Onoe Kikujirô IV held the name of Bandô Takesaburô IV from June 1919 to September 1935. Bandô Takesaburô V is the current holder of the name since March 1967.